The mechanical bull rental is one of the most exciting activities to participate in as well as witness at promotional events, trade shows as well as company & private parties. 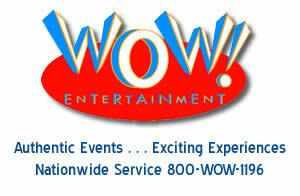 Contact a WOW Entertainment event specialist at 800-969-1196 or via email at info@wowincevents.com to learn even more about our mechanical bull rentals. This mechanical bull rental is operated by a certified mechanical bull rental operator. This operator has different controls in which to control the speed of the mechanical bull as well as the motion & the buck of the mechanical bull rental. The speed dial controls the 6 different levels of speed of the mechanical bull rental. This dial also controls the speed of the buck which is the mechanical bull rental moving up & down. The motion dial controls the back & forth action of the mechanical bull. These controls in combination by the certified operator create a unique experience for each party participant. Amongst the safety features of our mechanical bull rental is the head of the mechanical bull is soft. This is very important as other mechanical bull rentals use a fiberglass head. When a party bull rider is dislodged from a mechanical bull with a fiberglass head this may cause an injury. With a soft headed mechanical bull this concern is eliminated. Other safety features include an immediate cutoff switch that when the bull rider falls off, the mechanical bull stops moving. Additionally, the certified mechanical bull rental operator has completed extensive training and is in constant supervision of the action inside the bull ring. Guests at Galas and other Western Themed parties may feel uncomfortable participating on the mechanical bull rental. Our certified operator provides over sized shorts & boxers to protect clothing so bull riders will not be concerned about their clothing while bull riding. 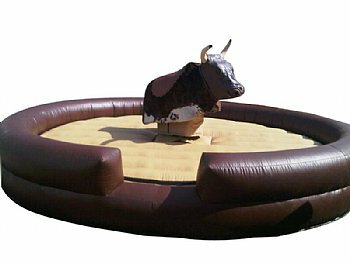 Mechanical bull rentals are a great addition to a variety of events including corporate team building, galas and promotional events. There are numerous opportunities for branding including the kiosk that controls the mechanical bull, the bull itself as well as displays placed on the outer perimeter of the bull ring. A large screen projection screen or plasma screens can be placed outside of the mechanical bull ring and the time of each bull rider can be displayed on the screens. Typical times do not last 30 seconds.